If you feel like immersing yourself in a sea of people and children waiting for carriages with children’s TV characters and other fantasy characters, lots of colour, music, confetti and tons of candy to which eagerly launch themselves not only the small ones, we can recommend the Kings’ Parade in Malaga which is one of the most lively and spectacular. The parade begins at 5:30 pm at the Town Hall and ends at Plaza de la Merced, with the following route: Paseo del Parque, Plaza de la Marina, Alameda Principal, Puerta del Mar, Atarazanas, Plaza de Arriola, Pasillo de Santa Isabel, Carreteria, Calle Álamos, Plaza de la Merced. The Guild Association of Holy Week of Malaga has put on sale the chairs to see the cavalcade of the Magi in Malaga on 5 January. On this occasion, the purchase of the chairs can be done through the internet, by phone or the box office of the Association. You can book your chair at the website www.agrupaciondecofradias.es or www.mientrada.net to the event ‘Cavalcade of Kings of Malaga 2017’. By telephone you can call 902 646 289 on weekdays, from 10 am to 2 pm and from 4 pm to 7 pm. The box office in calle Muro de San Julián will be open only from 2 to 5 January. From the 2nd to the 4th, opening hours will be from 10.30 am to 1.30 pm and from 5.30 to 8 pm. The day of the cavalcade it opens from 10 am to the start of the parade, approximately at around five in the afternoon. In Marbella, on January 5, the Three Kings will arrive by boat at the Marina at 12 o’clock. From there they travel the streets in vintage cars. At 18 h begins the parade with the following route: Avenida de Severo Ochoa, Avenida Ramón y Cajal, Avenida Ricardo Soriano, Monseñor Rodrigo Bocanegra. In Benalmádena the Three Kings also arrive by boat, at 6:00 pm at the Marina. In Arroyo de la Miel the parade begins at 6:30 pm. Itinerary: Parking Tívoli World, Avda. de Tívoli, Rotonda Nuevitas, Avda. de la Estación, Avda. de la Constitución, C/ Las Flores, C/ Sierrasol, bajada por Avda. Inmaculada Concepción, Avda. García Lorca, C/ Andalucía, C/ Blas Infante, Avda. de la Estación. In Benalmádena Pueblo the parade begins at 4:30 pm. Itinerary: Recinto Ferial los Nadales, Calle San Miguel, Avenida del Chorrillo, Avenida Juan Luís Peralta, Calle Jerónimo Garriga, Calle Lomillas, Plaza de España, Calle Real, Avenida Juan Luís Peralta. Calle Mallorca, Avenida de Mijas, Avenida Juan Gómez, Camino de Coín, Avenida Condes de San Isidro, Avenida Matías Sáenz de Tejada, Avenida Ramón y Cajal, y Avenida de Los Boliches. Avenida Rafael Quintana, calle Europa, Avenida Isabel Manoja, Avenida de Los Manantiales, Plaza Costa del Sol, Avenida Palma de Mallorca, Avenida Joan Miró, calle Doctor Jiménez Encina, calle García de la Serna, calle Rafael Quintana and again Blas Infante Square, place where the tour will end at approximately 8:00 p.m. The Three Kings will arrive by helicopter at the Las Lagunas soccer field from where they will begin the parade. Las Lagunas: From 5:00 pm the parade will leave from the Parque de María Zambrano, Miguel Hernández Avenue, Antonio Machado Street, Margarita Avenue, Camino Viejo de Coín, San Cristóbal Street, San Javier Street, La Unión Street, Mijas Avenue, Camino del Albero, Denmark Avenue, Geranio Street and arrival to Andalusia Park. Mijas Pueblo: At 5:00 pm from the Virgen de la Peña square, Virgen de la Peña avenue, Avenida de la Peña, Avenida de Méjico, Plaza de la Paz, Málaga street, Plaza de la Libertad, Málaga street, Constitución square, Avenida del Compas and finish in Virgen de la Peña square. La Cala de Mijas: At 5:00 pm from the Cultural Centre of Mijas, Marbella Street, Torreón Street, Torremolinos Street, Bulevar, Marbella Street, Cártama Street and will finish in the Butibamba Park. 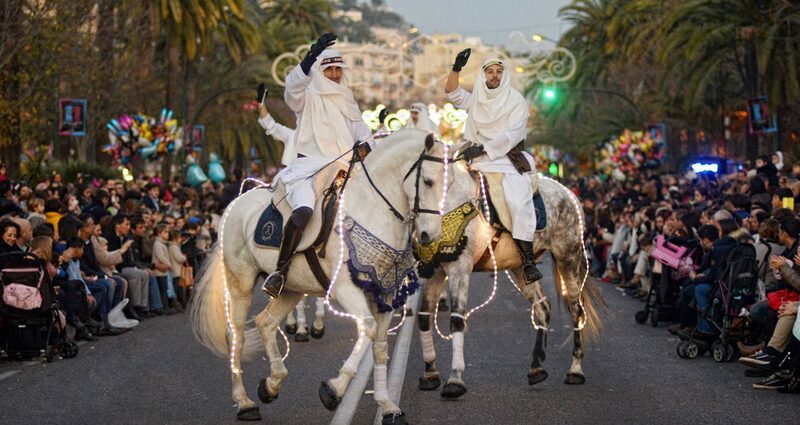 Do you know the route for the 3 kings parade in velez Malaga? Hello Bev! The parade in Vélez will tour the different streets of the town starting at 6 pm hours from Plaza de las Indias.